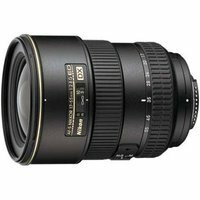 A professional DX Zoom Nikkor lens that combines a high ratio 3.2x focal length with SWM (Silent Wave Motor) and an f/2.8 aperture. With optics designed for the Nikon DX Format digital SLR cameras, the D2 series, the D200 or the D300, this lens delivers a picture angle equivalent to a 25-82mm 35 format zoom lens. Nikon HB-31 lens hood included.